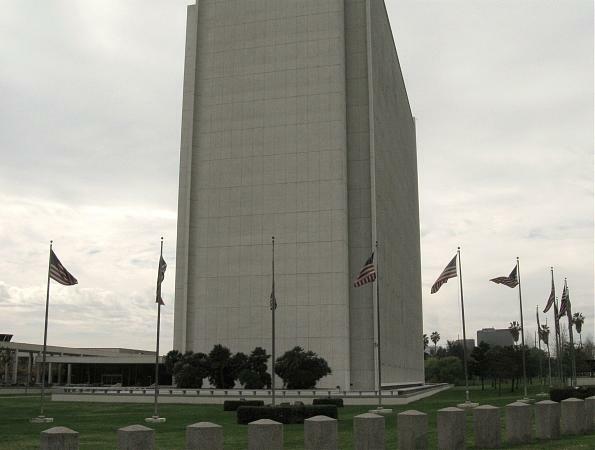 The General Services Administration (GSA) of Region 9 issued an invitation for proposals to replace an existing chiller with a higher efficiency 275 ton chiller at the United States Federal Building and Post Office in Los Angeles, California. One of the specifications included high performance at part load. A centrifugal chiller installation that featured an electronically controlled (inverter) variable speed drive was selected. The condenser tubes are internally ribbed for increased heat transfer efficiency. The condenser is equipped with an on-line brush automatic tube cleaning system to clean the inside surfaces of these tubes automatically according to a selected program (for example, three times per day). The building has 384,000 sq ft of usable floor space. In addition to the chiller discussed in this article, there are two other units. The 750 ton unit has not required cleaning since the on-line brush cleaning -system was installed. • The decision to invest the extra funds in a high performance chiller as opposed to a conventional performance unit has been justified by the return on investment. The added investment for the high performance chiller has been returned in less than two years of operation. • Most of the high performance advantage could be lost if the condenser tubes become fouled with mineral deposits or slime or mud from the circulating cooling tower water. Conventional treatment of the cooling tower circulating water, while serving to protect against corrosive conditions in the system, cannot guarantee prevention of fouling. The on-line brush cleaning system installed at this facility was guaranteed to prevent fouling. Tests after three years of operation demonstrate the system has operated well within that guarantee. • The added cost of the on-line brush cleaning system, while originally expected to have a return on investment within two years, has actually returned the investment in less than that because of the high operating load on this chiller imposed because of its low operating cost. • Important features of the online brush cleaning system installed at this facility are the removable end clips in the brush retainer baskets that permit removal of the brushes and inspection of the tubes. Also, the four-way flow reversing valve can be installed across the supply and discharge condenser circulating water piping without the requirement of installing additional elbows or fittings. • The experience at this facility has also demonstrated that condensers with tubes having helical internal ribs can be maintained in the clean condition by the on -line brush cleaning system. The selected chiller utilizes internally ribbed tubes in the condenser.The design fouling factor is 0.0005 sq ft per hr per deg F per Btu. At the chiller manufacturer’s option, the compressor capacity reduction and KW input reduction are achieved by providing a solid state controller for motor speed by controlled electrical frequency and voltage. Brushes to be installed in all condenser tubes so that they traverse the tubes upon reversal of the direction of water flow. Furnished brushes have nylon bristles that are secured by titanium wire. Retainer cages are also furnished with the system and are secured to the tube ends by an epoxy adhesive. Each retainer cage has a removable end clip that permits removal of the brush and electronic examination of the internal tube area. Four-way automatic flow reversing valve for installation in the condenser water piping. Valve furnished on this project can be installed without any extra pipe elbows or fittings, which results in minimum total pressure drop and lowest installation cost. The valve is moved by a pneumatic actuator. A control panel is also provided to reverse condenser water flow on a pre-programmed schedule. The three chillers are served by a bank of cooling towers with the condenser circulating water receiving conventional non-chromate water treatment. Condenser tubes Condenser tubes with helical internal ribbing have been offered for several years. One such tube is of the multiple helix type that reportedly requires areas of only one-third to two-thirds those of smooth tubes. Thus, the incentive for chiller manufacturers to use internal helical ribbed tubes, especially with new energy conservation demands, is apparent. The ribs cause increased turbulence at the water side film boundary and increased heat transfer surface per tube. The potential problem with such internal ribs, however, is that deposits from the circulating condenser water can collect in the valleys between the helical ribs. Not only normal scale but also suspended solids can collect in these areas. They were carried out to determine if an on-line brush cleaning system could maintain clean or near-clean heat transfer coefficients when used with chemically treated cooling tower water. For control, the test was first carried out for 7 5 days without the cleaning system in operation. During this period, the cleanliness factor had dropped to 63 percent. The second phase of the test was for the same time period but with the cleaning system in operation. During this period, the cleanliness factor was maintained at 93 percent. The importance of maintaining clean tubes is evident from the increased back pressure against which the compressor must work when the condenser tubes are fouled. For example, this rate of degradation in the cleanliness factor from 93 percent to 63 percent in 75 days increased compressor power requirements by 20 percent after 6 months of operation. This occurred with an established cooling tower water treatment program. After being in service for just over three years and in actual operation for 19,310 hr, the performance of the chiller was checked and a complete condenser water side inspection carried out by the GSA building maintenance department staff. No attempt was made to adjust performance to near rated conditions but merely to record the routine operation. For better accuracy, calibrated thermometers rated to 0.5 F were used for measuring chilled water temperature. Chilled water flow rate was measured by the installed flowmeter. Kilowatts were measured by the installed KW meter. The results are shown in Table 1. Note that the rated capacity for this chiller is 275 tons. During the performance check it was operating at 300 tons. Also, the chiller rating is based on 44 F leaving chilled water temperature and 85 F inlet condenser water temperature. 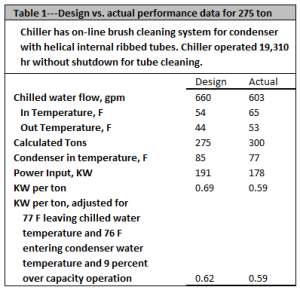 During the performance check, leaving chilled water temperature was 53 F, and inlet condenser water temperature was 77 F. If corrections are made for each of these variances from design, the adjusted “design” KW per ton is 0.62. This compares with the actual measured 0.59 KW per ton, which is well below the design rating for this chiller. The chiller maintained this performance after 19,310 operating hr without shutdown for cleaning of the condenser tubes. During the water-side inspection of the condenser, the water boxes were removed, and the brushes and baskets for all of the 440 tubes were found to be in place except for one where the removable end clip for the retainer cages was found to be missing along with the brush for that tube. A sample lot of brushes was removed for examination and measurement. The brush diameters were found to be well within the tolerance for usable brushes. Nevertheless, they were replaced. Some of the brushes had accumulations of hair, mud, sludge, and rust sludge on them but nothing that would be detrimental to performance of the brushes. In no brushes did the active ends of the bristles seem to be impaired. By removing the end clips from the retainer cages, one could examine the inside surfaces of the tubes. All appeared to be clean with the internal ribs clearly visible. They presented sharp, even edges and shadows when lit by a flashlight held at a slight angle to the axis. A cloth on the end of a screwdriver was inserted into two of the tubes and rotated without damaging the retainer cages. Virtually no debris or sludge was noted when the cloth was removed. Keep the tubes clear of deposits and to eliminate this source of tube failure. The savings in energy must be sufficient to repay the added capital cost investment for the cleaning system. In addition, there was some concern about using a condenser with helical internal ribbing in the tubes because of the possibility for serious fouling between the ridges. The projected savings in energy were shown to recover the added capital investment from 1.1 to 3.1 years depending on the load experience. The new ribbed tubes have a thinner tube wall at the valleys between ribs than do the conventional tubes with smooth interior surfaces, which gives less corrosion allowance. Also, deposits can collect in the valleys between ribs if the tubes cannot be kept clean; such deposits can cause accelerated galvanic corrosion.